On Saturday, I hopped on the train to London for some "me" time. Generally I find shopping a chore which is why I just love online shopping. I can search and locate anything with a click of a button and I never have to worry about the crowds, trawling through racks to find what I want and being squished inside a claustrophobic and dingy changing room. Nevertheless, there are times when you just got to try the clothes on, feel the fabric and test out various brands to get an idea what each piece is like before forking out the dosh. I learnt an important lesson. Never say never. No. No. Nothing earth shattering. After all, we're talking about fashion here. It's a self fulfilling prophecy because you'll inevitably do what you say you'll never do. 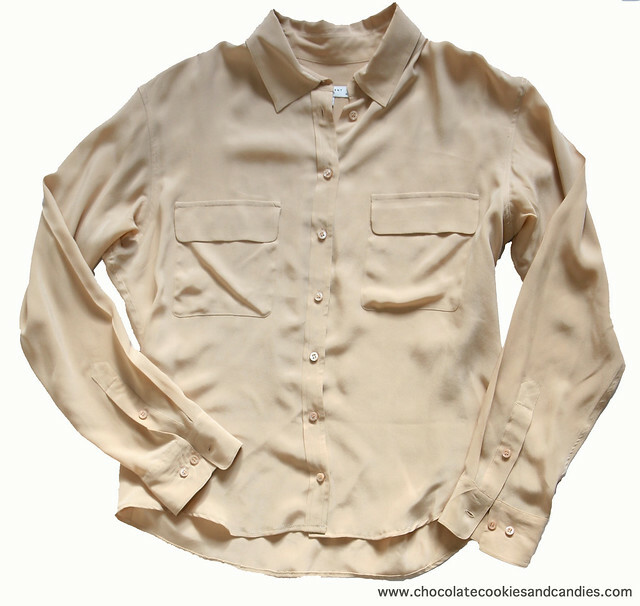 Remember my post here about Equipment silk shirts? Don't get me wrong. I think these oversized silk shirts are incredibly flattering and versatile but completely overpriced at £230 a pop. I've tried on a similar version at Zara but the fabric was too flimsy and thin. Not cheap too at £39.99 when you know it's going to fall apart after a few washes. Imagine my delight when I found a preloved Equipment shirt in blush in near new condition for a third of the original price tag. I tend to avoid Harrods like the plague but Harvey Nichols always has the most amazing selection of clothes. Recently, I've found out that they're now stocking Etoile Isabel Marant. Woohooooo! I no longer have to make the long trudge to Aime or Shop at Bluebird. The one thing about these department stores is they all try to stock different pieces from the collection which makes shopping a pain. When it comes to shopping, I have the attention span of a gnat. I consider zipping back and forth between Selfridges, Liberty and Harvey Nichols as nothing short of torture. However, I was pretty impressed with the choices of pieces on display at Harvey Nichols. If I were a millionaire, I'd happily buy up most of the Etoile Isabel Marant collection there including the divine leopard print silk shirt, something I thought I'd never wear. Luckily for my bank account, they sold out of my size. 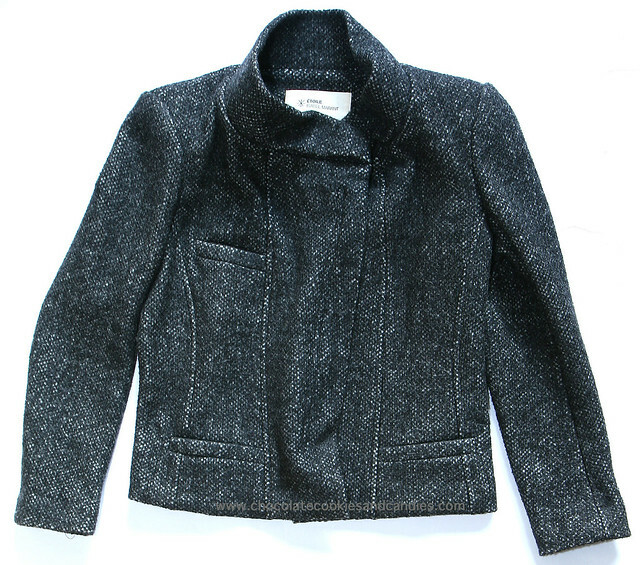 The first time I tried on the Isabel Marant Fred jacket which is made of 100% wool was right in the height of summer. The sweltering heat coupled with the sauna like fitting room made me itch unbearably. The second was a hurried visit when I dragged a close friend and shopping buddy of mine to Liberty with barely enough time to actually try it on. The third time was a charm. It helped that I was in this humongous fitting room with mirrors all around and proper lighting to really get an idea of the fit. The structured motorcycle style jacket is amazingly flattering. In fact, I looked positively slim - without having to go on a crash diet. Furthermore, I'm just bowled over at how versatile it is because you can change the look of the jacket depending on how your wear. That jacket is absolutely beautiful! And I'm so glad you got such a great deal ont he Equipment shirt- what a great find! omg that tweed jacket is GORGEOUS!!!! great buys as always! As always, you've picked beautiful and timeless pieces! I can see both items in a conservative office-friendly outfit but also something more fun and dressed up for a lunch or dinner date. I think the two would look great paired together, too! Looking for this kind of jackets for a long time !! Wow !! Take a look at my last post if you wanna see some Moroccan caftans !! Sharon, I was comparing how I look to how YOU look and there's a vast difference. You've got these looooong legs while I might have to stick to heels if I wear the same J Brand jeans. Skippysays, thank you! I'm thrilled I didn't have to pay full price for the silk shirt. 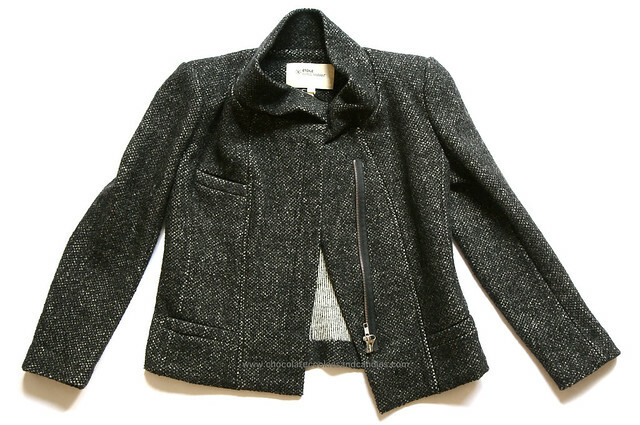 ShinyPrettyThings, I'm so glad you like the Isabel Marant jacket. Vale, thank you for dropping by! Good to see you here. Kim, that's so sweet of you to give me the award! I'll definitely check it out later tonight. LOL. I'm glad you like my sometimes rather crazy comments. Lindsay, thank you!! You're absolutely right. I think it's a very versatile jacket which will get a lot of mileage. Ginger, you won't regret getting this IM jacket. Oooooh Moroccan caftans. For sure! I'll check it out. thank you for visit my Miriamstella's blog ! So, what did you think of the Equipment shirt? I've been considering buying one now that Shopbop and Saks both have friends & family promotions, but even with 20% off they're still expensive. I cant't tell if the shape would look great on me, or whether it would just make me look sloppy. What are your thoughts on the quality/fit? Mary Lane, the Equipment shirt has quite a nice heavy feel to it which I like. It IS quite oversized but does cling on the body really nicely. I bought size M because that was what's available but I also wanted the length. You can actually size down . The quality is good. Is it better than the awesome silk shirts I bought from China at $10? No. The fit's very good. I would pair it with skinny pants because it IS slouchy.